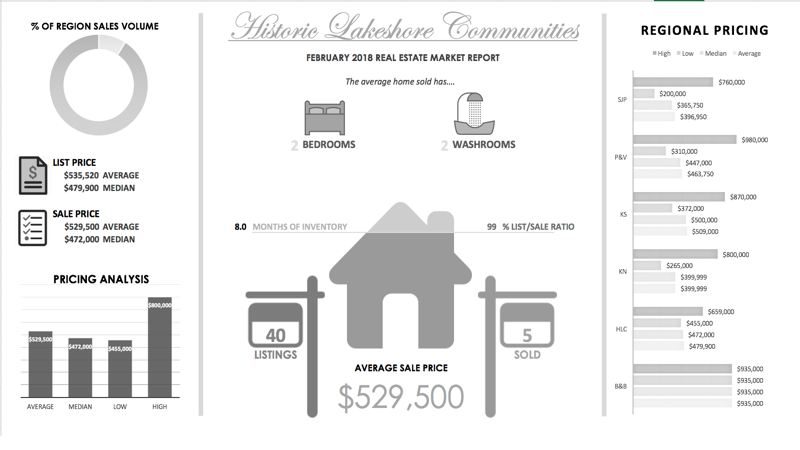 Historic Lakeshore Communities real estate market infographic The average size of a home in Historic Lakeshore Communities has 2 bedrooms and 2 washrooms. $535,520 is the average list price of a home in Historic Lakeshore Communities while the average sale price is . There are currently 40 homes for sale in Historic Lakeshore Communities home sold in the area, meaning that there are 8.0 months of real estate inventory available in Historic Lakeshore Communities . Historic Lakeshore Communities s list price to sale price ratio was 99 %. Historic Lakeshore Communities s highest real estate sale price for the month was $659,000 . Historic Lakeshore Communities s lowest real estate sale price for the month was $455,000 . Historic Lakeshore Communities median home sale price for the month was $472,000 . Historic Lakeshore Communities average real estate taxes for the month were $3,136 Historic Lakeshore Communities average days on market for a property listed for sale was 14 days.